H.E. 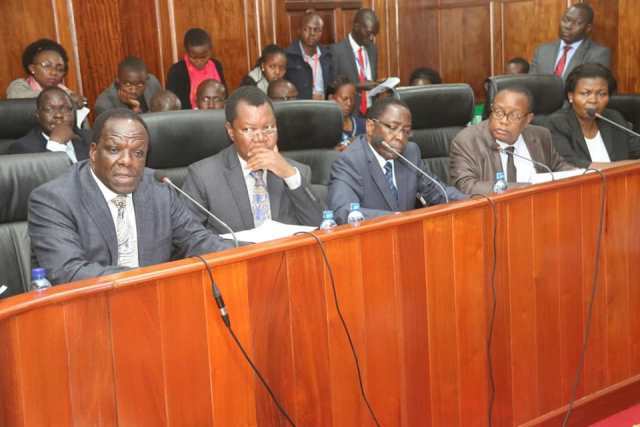 Governor Wycliffe Ambetsa Oparanya today appeared before the Senate’s Public Accounts Committee (PAC) to shed light on the county government’s financial statements dated 30th June 2015. Speaking before the committee, Governor Oparanya said he had failed to honour previous committee’s summons because they were contradictory to a court ruling directing that Governors’ do not have to appear before the committee to answer to audit queries. The Governor however said he was open to any issue raised by the committee as the CEO of Kakamega county especially on matters to do with policy. He said this was not the first time county government staff were appearing before the committee adding that senior county staff led by H.E. the deputy governor Prof. Philip Museve Kutima had appeared, responded to questions raised and made presentations before the committee. “I however still hold the opinion that county assemblies should be allowed to discharge this important role of putting the executive at the County level to task on issues to do with accountability and prudent use of public funds, ” he said. Governor Oparanya said some of the concerns raised in the auditor’s report such as the Fixed Assets Register have been overtaken by events as the county has an existing and well documented Assets and Liabilities register and even gone ahead and recovered more assets that had not been factored or documented by the Transitional Authority. Committee Chairman and Homabay Senator Hon. Moses Otieno Kajwang’ thanked Governor Oparanya for finding time to appear before the committee. Senator Kajwang’ said most of the queries raised by the office of the Auditor General were hastily concluded by the office before putting into consideration a response from the county government. He however called on the concerned county officers and departments to provide the relevant documentation on time whenever they are required to by the Auditor General. County Finance and Planning CECM Geoffrey Omulayi said the county government has availed the relevant documents to the office of the Auditor General and will in future work closely with the office to ensure a speedy conclusion of the process. The Governor was accompanied by his deputy H.E. Prof. Philip Museve Kutima, County Secretary Madam Jacinta Aluoch Odhiambo, Finance and Planning CECM, Geoffrey Omulayi, Chief Officers and other senior government officers.